Home/Uncategorized/How many solar panels do I need? The costs of electricity are always going up, not down. That’s why many electricity customers are looking for both fiscal and environmental ways to address the problem. Solar panels help to do both by cutting your electric bill by hundreds of dollars a year, while at the same time not requiring a man-made installation to send electricity your way, at least for part of the time. The average kWh (kilowatt hour) usage per year by Colorado utilities’ customers was 8,244, according to the U.S. Energy Information Administration (data from 2014). That works out to an average of 687 kWh per customer. At about 12¢ per kWh, the average Colorado customer is paying around $1,000 per year. So how do solar panels influence this yearly utility cost? The answer is that it depends. 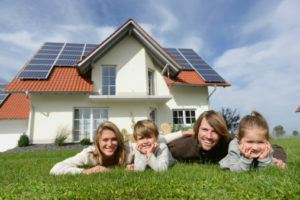 Using solar panels can reduce your costs by a lot, or at least a little, depending on the square footage of your roof and the state you live in. Also playing a part in the equation is the size of the solar panel itself. Although at one time no standard size existed, solar panel manufacturers have established a size that’s more or less the standard among the various companies. For residential roofs, that size is approximately 65″ x 40″, which translates to 5½ ft. by 3¼ ft. That means each solar panel takes up about 15¾ square feet, or 16 rounded up for ease of calculation. Each of those 16 square foot panels outputs an average of 200 watts. Now let’s calculate how many panels fit on an average roof area. Given the roof pitch and angles, you most likely don’t want to put solar panels on every square inch of your roof. Most guides list a southern exposure as the best part of your roof to use, although some experts say southwest or even west, depending on the time in which you use the heaviest amount of electricity — and where the sun is at that time. With that background, let’s use 400 as your available square footage area, and do some quick math to figure out how many panels you need and how much electricity it will put out. Divide 400 square feet by the solar panel’s 16 square feet, or 18 square feet with setbacks and racking space: 400/18= 22 panels, which is the number your roof will hold. Each panel puts out 300 watts, which needs to be converted (divided by 1,000) to KW to work with the other numbers: 300/1000 = 0.3 KW per panel. 22 panels x 0.3 kWh = 6.6 KW for your entire solar panel section. Some final calculations get you to where you know how much your solar panel system will produce and save per year. The Denver/Boulder and surrounding area lies in the 1900 band, according to solarpowerrocks.com. Multiply your 6.6 kWh solar panel system by 1,900, which results in 12,540. You can’t capture 100 percent efficiency from your solar panels, so Solar Power Rocks offers the number 0.78 to represent the true number. Multiply 0.78 by 12,540 to get the real kWh output.In the Front Range area, you can expect 9,781 kWh output per year from your solar panels. Customers living in the Front Range area pay about 12¢ per kWh, so 9,781 kWh/year x $0.12/kWh = $1,174 saved per year. There may also be Utility sponsored rebates that add to that total. However, for precise amounts, you need to check your monthly utility bill. Lots of factors are jostling to influence your electricity bill, including your own priorities regarding finances and the environment. Doing your own research will naturally result in the most accurate numbers to use to help you make your decision.